Carefully read instructions and follow the installation wizard. Actionpoint: Allows you to create interactive PowerPoint presentations. Answer Key: Is for presenting and grading paper tests and activities. Content Manager: Organize and present Qwizdom activities. 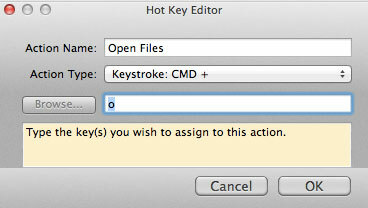 Hot-Key Editor: Q7 Tablet users can customize soft key actions. Live Editor: Create and edit Qwizdom activities. Participant Service: Create and edit class lists. 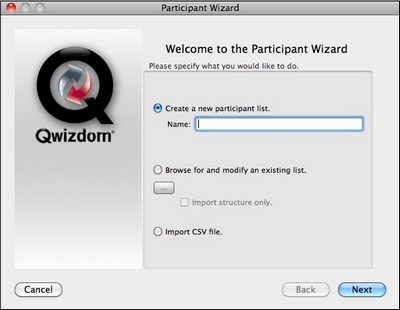 Qwizdom Tools: Launch Qwizdom applications. Response App, online classes and reporting. register, check your Junk or Spam folder for emails sent by Qwizdom. Click on the Qwizdom Connect icon to open Qwizdom Connect. Online. Login to with your username and password. We do not recommend using the red host with Qwizdom Mac Actionpoint or Mac Connect software. Email support at support@qwizdom.com for details. Follow the steps below to set up remotes. Be sure the HID or RF host* is properly installed before proceeding. * v.938 host or higher is required for Qwizdom Connect. If the host is not v.938 host or higher, please contact Technical Support. Select Configuration Preferences. The Remote Preferences window opens. Newer remotes, received in 2012 or later, already come with pre-assigned numbers, matching their affixed stickers, so no further action is required. Click OK to finish. Using Q4 remotes older – check this to assign Remotes ID numbers to older Q4s. 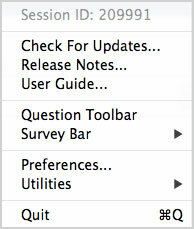 To check the version number, turn on a Q4 remote by holding down the Menu key. The version number will appear on screen. HID RF host (Black Base) – most Commonly used host. Roaming Set or Participant Owned– check this option if the participants own the remotes. This mode is best-suited for Higher Ed/University settings. Participants are required to either enter a session ID and participant ID to join a presentation. 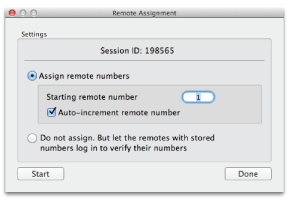 In the Remote Preferences window, select Set with remote IDs and click the Assigned Fixed IDs button. This process only needs done once—the assigned number will remain fixed with that remote. If desired, use a marker, or affix a sticker, to designate the number that has been assigned to that remote. If your remotes do not connect, they are not configured with the correct Session ID. See Changing Session IDs, below for details. Click Stop when all remotes have been assigned. Click Done to close the window. Remotes will turn off automatically. Open Qwizdom Connect, click on the Remotes menu, and select Configuration Preferences. 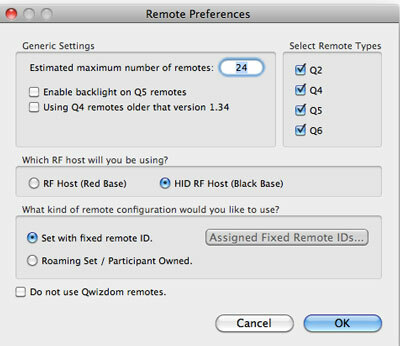 In the Remote Preferences window, check the box for Using Q4 Remotes Older Than Version 1.34. Select Set with remote IDs and click the Assigned Fixed IDs button. Turn the remotes on. When the remotes communicate with the host, the serial number and the remote’s assigned ID number will appear in the window. If the remotes are prompting for the session ID, enter the session ID that is displayed at the bottom of the Assign Fixed Remote ID window. After all the remotes have been assigned, click Done to exit the Assigned Fixed Remote IDs window. Please Note: You only have to assign fixed numbers once, unless you change computers or hosts. If the RF remote or tablet displays No Net, Not Found, Not Active, or Inactive, it could be that the session ID is not correct. For Q2RF remotes: wait for the remote to time out and turn off. When you turn it back on, press the Help key. When you see –S on the display, it is prompting you for the session ID. Enter it and press the Send key to confirm. For Q4RF remotes: press the Menu key, use the right arrow to scroll to Sess. ID., and press the Send (double arrows) key to select the option. You will see the current session ID and will be asked if you want to change the session ID. Press T (Yes) to change. Enter the session ID and press the Send (double arrows) key to send. For Q5RF remotes: wait for the remote to display No Net, Not Active, or Not Found. Press the Menu key and select Enter Session ID using the Send (double arrows) key or the circle key on the thumb pad. Enter the session ID and press the Send (double arrows) key. For Q6RF remotes: press the Menu key, scroll to Enter Session ID, press the Menu Select key, reenter the Session ID, and press the Search Again key. For Q7 tablet: press the Menu key and use the Scroll button to select Enter Session ID. Press the Enter key to select it and enter the session ID. Press the Enter key to confirm. 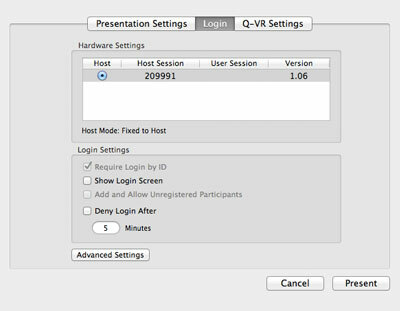 For both HID (Black) and RF (Red) host, the session ID can be found in the Assigned Fixed Remote IDs window, the Login tab in the Presentation Setup window, and the Login tab during a presentation in the Qwizdom Tool. See Presentation Features for details. For the HID (Black) Host, click Qwizdom Tools, found in the top right-hand corner of your computer screen. The Session ID will be displayed at the top of the menu. For the RF host, the session ID can be found on the bottom of the device on a white sticker. You can also create your own Session ID in the Presentation Setup window. Creating your own Session ID does not change the host’s default Session ID. See Presentation Setup for details. The Session ID must be unique because if there are other hosts in the same building, the remotes will not know which host to connect with. Tablet Functions when presenting an activity using Qwizdom Mac Connect Software Suite. 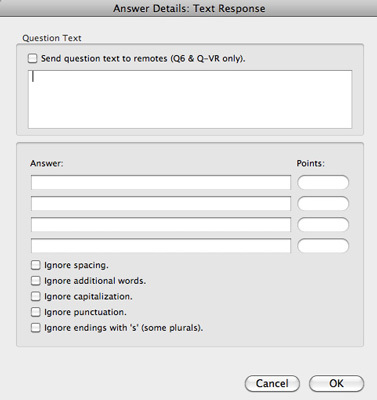 Q7 has limited annotation features when presenting Actionpoint activities. Content Manager is where all created and imported activities are stored. Double-click Content Manager found in the Finder/Applications window to launch Content Manager. Content Manager menu – Check software version number and set state standards preferences. File menu – import and export presentations and activities . Qwizdom Online menu – login to Connect Online to access premade activities and the media library. See Online Registration for details. Connect Apps menu – displays the 3 applications within the software suite. Remotes menu – setup remote handling. Help menu – view user guide. 1. Click the Add Folder button. 2. Enter a name for the folder and click Done. 3. The folder appears in the Content Tree on the left. 1. Double-click on the Content Manager button. 2. Double-click the activity you wish to edit in the Content Tree on the left. 3. This will launch Live Editor. Edit your activity in Live Editor. See Creating Slides for more information. 1. Click the black arrow to the right of the Add File button. 2. Select Create and Add Answer Key file and enter a name. 3. Click Done and the answer key will appear in the Content Tree on the left. 4. Double-click the answer key file to launch the Answer Key window. See Answer Key for more information. Go to the File menu and select Import / Qwizdom Activity. The Open window appears. Select the Import / Qwizdom Activity you would like to import and click Open. The activity will import into the Content Tree. Go to the File menu and select Import External Document. The Open window appears. Select the activity you want to export. Go to the File menu and select Export. The Export Activity window appears. Choose the location to which to export your file and click Save. Standards will auto-install during the first use. See Installing Standards for details. Select the desired set of standards you wish to use, located in the lower left hand corner of the Standards window. Select the standard at the level you want to apply to the activity. Select Apply Standards to All Questions. Click Link and then Close. The standards will appear in the Standards tab at the bottom of the Content Manager window. Select an activity in the Content Tree. Click on a slide/s in the Activity Preview window on the right. 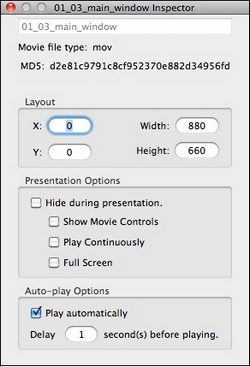 Use the Command key to select multiple slides, if desired. Select the desired set of standards you wish to use. Located in the lower left hand corner of the window. Select Apply Standards to Selected Questions. Create and present multimedia activities, lessons and tests in Live Editor. Use premade styles, tools and templates or create your own. Click New Activity and select Create and Add Live Editor File. Enter a name for your new activity and click Done. The new activity name will appear in the left column. Double-click the activity name to launch Live Editor and begin creating the slide set. Activity Properties – Select an item on a slide to view properties such as size, source,opacity, etc. 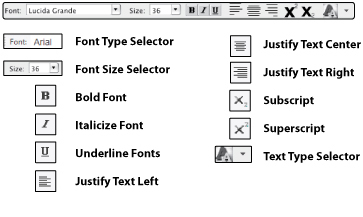 Click the Text tool drop-down arrow and choose a styled font. Click on the slide, to add a text box. Double-click inside of the text box and add text. Highlight text and click Color to change the color of the text. 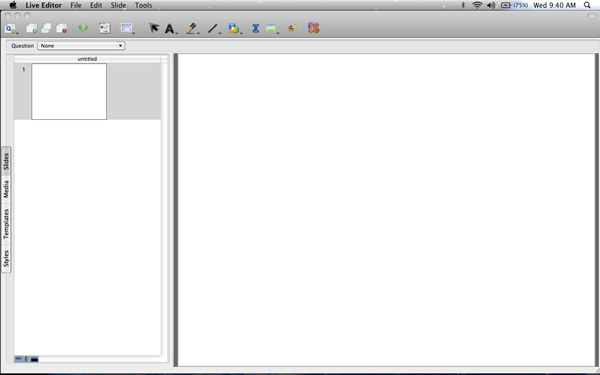 Click off of the text box and use the handles to move and resize text box. 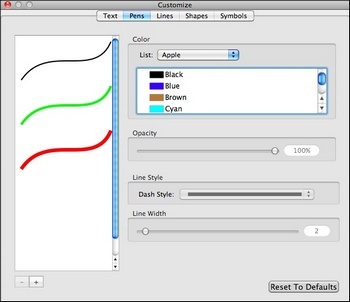 Click the Pen tool drop-down arrow and choose a pen style. (Optional) Select Customize . The Customize Pens window appears. Click Add. Scroll down and select the newly added pen style. Set thickness, color, and transparency. Click Delete to delete a pen style. (Optional) Select Customize. The Customize Line window appears. Click Add. Scroll down and select the newly added line style. Set thickness, color, and transparency. Click Delete to delete a line style. (Optional) Select Customize. The Customize Shapes window appears. Click Add. Scroll down and select the newly added shape. Set thickness, color, and transparency. Click Delete to delete a shape. 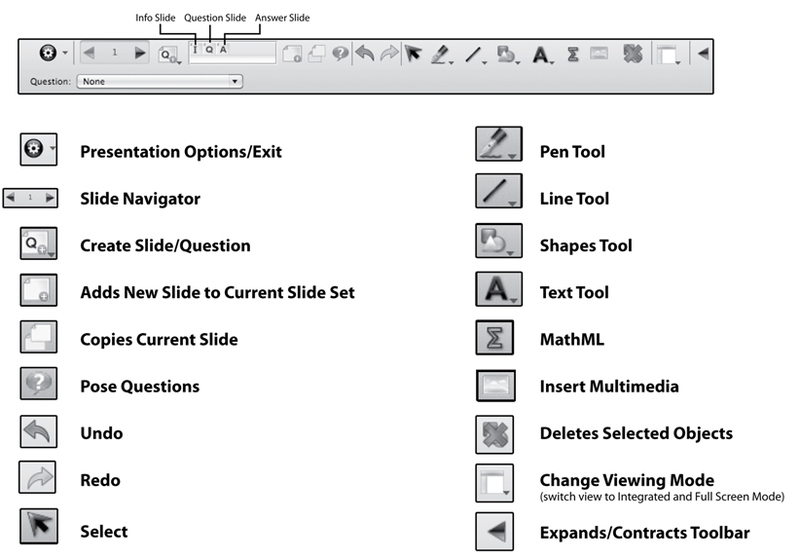 Answer Toolbar – see Creating Slides for details. Multiple Choice – multiple choice question slide (up to six choices).Use with Q2RF, Q4RF, Q5RF, Q6RF and QVR App. Yes/No – yes/no question slide. Use with Q2RF, Q4RF, Q5RF, Q6RF and QVR App. True/False – true/false question slide. Use with Q2RF, Q4RF, Q5RF, Q6RF and QVR App. Numeric – numeric question slide. Single digit numeric answer allowed for Q2RF. Nine digit numeric answer allowed for Q4RF. Eight digit numeric answer allowed for Q5RF. Fourteen digit numeric answer allowed for Q6RF. Sequence – place item choices in the specified order. Use with Q4RF, Q5RF, Q6RF and QVR App. Multiple Mark – this question type enables two or more correct answers (up to six choices). Use with Q4RF, Q5RF, Q6RF and QVR App. Rating Scale/Survey – rating/opinions/polling using scales from 1-5, 1-10, etc. Use with Q2RF(single digit), Q4RF, Q5RF, Q6RF and QVR App. Short Text Response – (Q5RF & Q6RF remotes or QVR Response App) best used for single word responses were capitalization does not matter. Text Response – (Q6RF remotes or QVR Response App). Best used for short phrase responses, feature allows for punctuation, spacing, and other advance grading options. 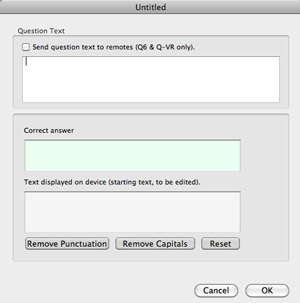 Text Edit – (Q6RF remotes or QVR Response App) participants are given a sentence, phrase, or item that they can correct on the Q6RF remote. 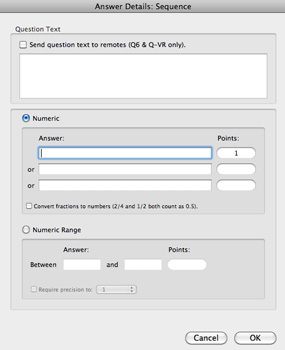 Equation – (Q6RF remotes or QVR Response App) create questions that allows participants to respond with numeric answers, including special characters. Allows you to search and use images in the Qwizdom database and/ or your computer. Double-click the activity name to launch Live Editor and begin creating the slide sets. Information Slide : Non-question slide (non-remote). Click the New Question button. 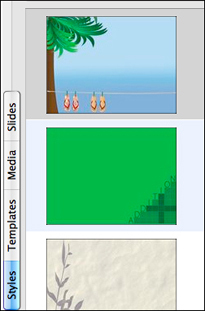 A blank slide will appear on the right and a thumbnail preview of the slide will appear in the Slides tab on the left. Click the Question drop-down list and select None as the slide type. (Optional) Click on the Templates tab. Select a template; click and drag the template onto the slide. See Styles and Templates for more details. (Optional) Add multimedia such as images, movies, and sound. Click on the Media tab. Select the Search (Online) tab. Type in a keyword/s and click Search. Drag and drop multimedia items onto slide. When the slide is complete, either go to the File menu, select Save, and close the window; or click the New Question button to create a new slide set. Multiple choice question slide (up to six choices). 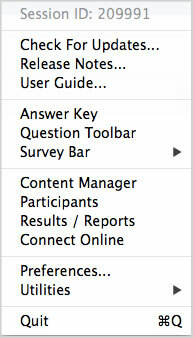 Click the Question drop-down list and select Multiple Choice as the slide type. (Optional) Click the Advanced Options button. This will bring up the Answer Details window. Enter point value and send questions to Q6RF remotes. Click OK to save and close window. (Optional)Create an answer slide. Click the Add Answer Slide button. A new slide will appear within the slide set. When the slide/slide set is complete, either go to the File menu, select Save, and close the window; or click the New Question button to create a new slide set. (Optional) Add multimedia such as images, movies, and sound. Click on the Media tab. Select the Search (Online) tab. Type in a keyword/s, and click Search. Drag and drop multimedia items onto slide. Click the Advanced Options button to change point value and/or send question text to Q6 participant remotes. Single digit numeric answer allowed for Q2RF; nine digit numeric answer allowed for Q4RF; eight digit numeric answer allowed for Q5RF; 14 digit numeric answer allowed for Q6RF. Over 14 digit numeric allowed for the QVR. Click the Question drop-down list and select Numeric as the slide type. Enter the correct answer in the Answer field. (Optional) Set partial grading options. Click the Advance Options button. This brings up the Answer Details window. Enter the answer/s and point value/s. Click OK to save and close. Numeric – Select Numeric to add in standard numeric answer/s. (Optional) Enter in multiple answers and point values to give students partial credit. (Optional) Check the Convert fractions to numbers box to allow both fraction and decimal answers to be counted as correct. If this box is unchecked only the answer that is typed into the above field will be counted as correct.Numeric Range – Select Numeric Range to add an answer for rounding, number set, algebraic and other problems with a varying answer range. (Optional) Check the Require Precision to box and select a place value from the drop-down menu.5. (Optional) Set the time limit and/or points. 6. (Optional) Click on the Templates tab. Select a template; click and drag the template onto the slide. See Styles and Templates for more details. 7. Enter text onto the slide. 8. (Optional) Add multimedia such as images, movies, and sound. Click on the Media tab. Select the Search (Online) tab. Type in a keyword/s, and click Search. Drag and drop multimedia items onto slide. 9. (Optional) Add custom style to slide. Click the Styles tab, browse and select a style. Drag and drop style onto slide. See Styles and Templates for more details. 10. (Optional)Create an answer slide. Click the Add Answer Slide button. A new slide will appear within the slide set. 11. When the slide/slide set is complete, either go to the File menu, select Save, and close the window; or click the New Question button to create a new slide set. Place item choices in the specified order. 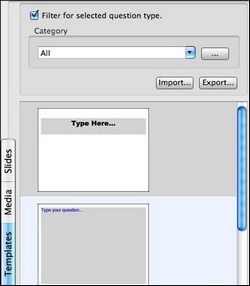 Click the Question drop-down list and select Sequence as the slide type. 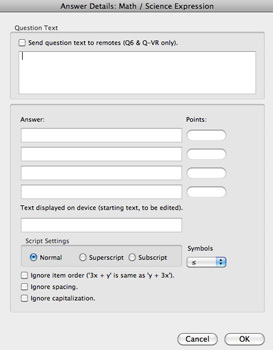 (Optional) Click the Advance Options button to set partial grading options and/or send text to Q6 participant remotes. (Optional) Create an answer slide. Click the Add Answer Slide button. A new slide will appear within the slide set. This question type enables two or more correct answers (up to six choices). Click the Question drop-down list and select Multiple Mark as the slide type. Enter the correct answer(s) in the Answer field. Rating scale question slide (i.e. rating/opinions/polling using scales from 1-5, 1-10, etc.). Q2RF remotes support (1-5 ) and (1-7). Q4RF, Q5RF, Q6RF & QVR App support all rating scale options. Click the Question drop-down list and select Rating Scale as the slide type. Answer can be up to 32 characters long on the Q5RF remote. Best used for single word responses were capitalization does not matter. Click the Question drop-down list and select Short Text Response as the slide type. Click the Answer field and type in answer. Answers can be approximately 144 characters , including punctuation and spacing. 2. Click the Type drop-down list and select Text Response as the slide type. 3. (Optional) Click on the Templates tab. Select a template; click and drag the template onto the slide. See Styles and Templates for more details. 5. Enter text onto the slide. 6. (Optional) Add multimedia such as images, movies, and sound. Click on the Media tab. Select the Search (Online) tab. Type in a keyword/s, and click Search. Drag and drop multimedia items onto slide. 7. (Optional) Add custom style to slide. Click the Styles tab, browse and select a style. Drag and drop style onto slide. See Styles and Templates for more details. 8. (Optional) Set the time limit. 9. Click the button. This brings up the Answer Details window. – (Optional) Send questions to Q6RF. Check the Send Question Text to Remotes box. – Fill in answer/s in the Answer field. Enter the number of points. Multiple answers and point values can be added for partial grading (whole numbers only). – (Optional) Set grading options. Participant’s answers will be marked right or wrong based on these options. – Click OK when finished. 10. (Optional) Create an answer slide. Click the Add Answer Slide button. A new slide will appear within the slide set. 11. When the slide is complete, either go to the File menu, select Save, and close the window; or click the New Question button to create a new slide set. Click the Type drop-down list and select Text Edit as the slide type. Click the button. This brings up the Answer Details window. – Enter the correct answer in the Correct Answer Text field. – Enter the text to be edited by participant in the Text Displayed on Device field. 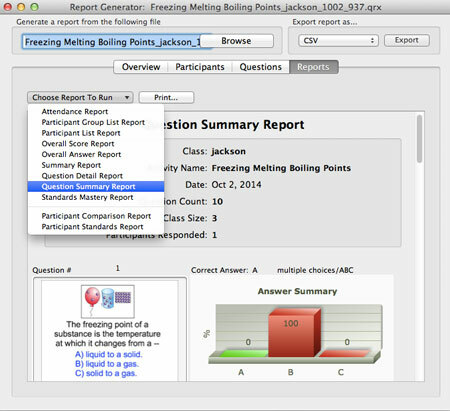 Create questions that allow participants to respond with numeric answers, including special characters. Click the Type drop-down list and select Equation as the slide type. – (Optional) Fill in answer/s in the Answer field. Enter the number of points. Multiple answers and point values can be added for partial grading (whole numbers only). – (Optional) Add an equation to be edited by participant in the Text Display on Device field. 1. Click the Equation button. The Equation from Live Editor window opens. 2. Create an equation in the window. 3. Close window when finished. 4. The equation will appear on the slide as an object. 5. You can resize the equation by stretching the handles (click and drag). 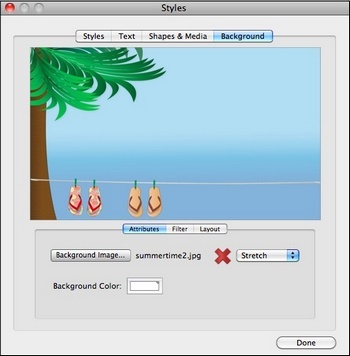 Live Editor makes creating, editing and applying styles and templates easy. Create a slide with or without text. Click the Styles tab. You can either select a style to use by browsing all the available styles or select a Category from the drop-down menu to select from a particular set of styles. Click and drag the style to the slide (on the right) to apply. 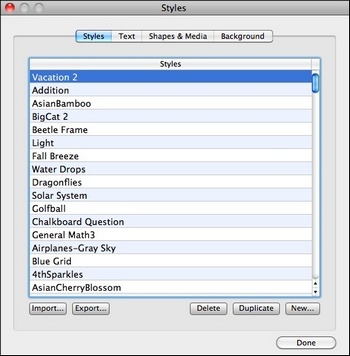 You are able to change the font style, size, and color (if applicable) after applying the style. Click the Edit Styles button. This will bring up the Styles window. Click New. An untitled style row will appear. Double-click on the untitled style to rename it and press the Return key to save it. Create a unique name for each style to make it easier and more accurate for importing, exporting, and applying styles. 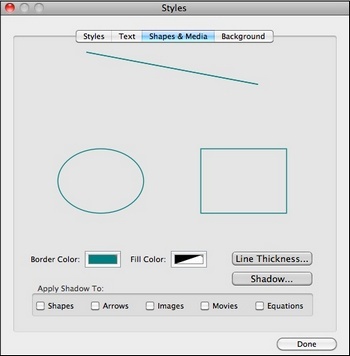 Click each tab to customize text, shapes & media, and backgrounds of your newly created style. To view the newly added style(s), select the All category. Styles appear in alphabetic order. Line thickness – determines the size of stroke applied to drawn shapes. To select thickness, click Line Thickness and select the thickness of the line. Background Image – Browse for the image. Click Open, and a preview will appear in the Sample window. Select the appropriate scaling option, stretch, tile or center. Background Color – click inside the Background Color box to change background color . Filter – applies a tint to your background image. Select the Content and Background Filter Opacity. Layout – changes the color behind your content. Select the layout and how it should be scaled on the slide. Please Note: The Content Filter Opacity will overwrite your Filter Color unless you scale the size of content (see below for Content Scaling). Select the style you want to edit and edit the style settings. Select the style you want to delete. Click Delete. A prompt will appear asking if you want to delete. Click Done to exit the Styles Window. Click Edit Styles. 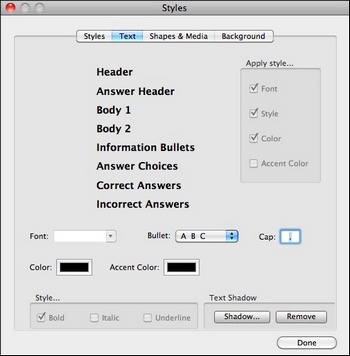 The Styles window appears. Click Import. The Import Styles window appears. Click Open. The style will import into the Styles window. If there is a style of the same name that already exists in the Styles window, it will ask you to Overwrite or Ignore. Exporting styles exports all styles as a .QSP file. Click Edit Styles. The Styles window opens. Click Export. The Export All Styles window opens. Click and drag the template onto the slide. Templates must be applied before adding text and multimedia to a slide. The template will be created and added to the Templates tab. Please Note: Check the Filter for selected question type box to sort and display the templates for a specified question type. By default, there are no predetermined template categories. You must create categories, see Creating Categories for Templates below for more information. Setting up categories allows you to filter your templates by question type, answer slides, or preferences. Click the Browse button that is located next to the Category drop-down. The Categories Editor window appears. Click Add and it will add an untitled category. Double-click on the untitled category to enter a category name. Using the Category drop-down menu, select a category. 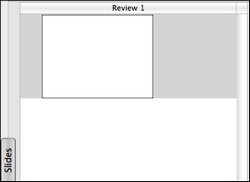 Click on a template, this will bring up the Template Inspector window. Check all templates that apply to the category. The image will appear on the slide. Images matching the keyword(s) you entered will appear in the Media tab. The movie will appear on the slide. The sound file will appear on the slide. 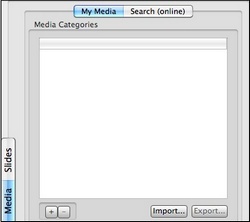 Control-click on a video to bring up the Media Properties window. Play Continuously – repeats movie or sound file continuously when the slide is displayed. Media Control is used for presentation when an Instructor Remote or Q7RF tablet will not be used. Go to the Tools menu and select Full Screen Settings / Movie Controls. The Movie Controls window appears. Select Create a new participant list. Enter a name for the class and click Next. Select a Template and then click Next. Templates are commonly used fields that allow you to customize a participant list. Select the different fields you would like to use and click Next. If you do not see a field you would like in the participant list, you can create a customized field and add it to your template. Click Next. The participant list template will appear. Fill in the fields and click Finish. The participant list will save into the Participants tab. 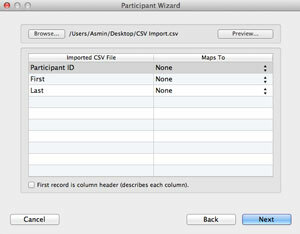 You can import .CSV class and convert it into Qwizdom participant lists (.QPL). Please Notes: If you have a class list in Microsoft Excel® you would like to import, save it as a .CSV (comma delimited) file. Click Browse. The Open window will appear. Select the .CSV file and click Open. Match the fields on the left to the fields on the right. If the information on the left are headers, check the First Record is Header box, otherwise leave it unchecked. Click Next when all the fields have been matched. The participant list will appear. Click Finish. The participant list will save into the Participants tab. Before using an anonymous list, be sure you have the correct estimated number of remotes set within the Remote Preferences window. For example, if you create an anonymous list with a hundred participants but only have eighty as the estimated number of remotes, then not all remotes will register. Users will be prompted to enter a User ID. Participants will be identified by their User ID numbers throughout the session. You can view students’ answers, post-session. Click on the Results tab, select the results file. The Overall Score Report will appear. Scores can be tracked by User/ Participant IDs. The Browse for and modify an existing list is selected by default. Click Next. You will be taken to Participant Field Selection. You may add new fields or remove existing fields. Click Next. The participant list will appear. Delete Students: Select a student and then select Remove from the drop-down menu. Renumber Remotes: Select Renumber Remote IDs from the drop-down menu. Click Finish when done. A prompt will appear asking if you want to overwrite or rename the participant list. Select Overwrite if you want to save the changes to the original participant list, or select Rename to create a new participant list. Once finished, the changes to the participant list will appear in the Participants tab. Automatically organize students into groups based on Ability, Odd and Even Numbers, Activity Score, or Performance. Groups can be used when playing Quandary. See Games for details. Select the class for which you want to create groups. Click the Groups button. The Group Management window will open. Balance: Creates balanced ability groups from either the Predefined Ability Ratings (set in the participant list*) or scores from a selected activity. Group Similar: Groups students with similar Ability Ratings (set in the participant list*) or scores from a selected activity. Add the number of students per group. Click Generate to create the groups. * Create a custom field named ‘Ability’ in the participant list. See for Creating Classes details. Click Present to begin the presentation. Pick: Randomly call upon a participant. (Click the Pick button on the Q7RF Tablet, the (.) Pick button on the Q5RF Instructor remote or the (1) button on the Q6i. Go through the presentation until all the question slides are answered. See Using Remotes in Presentation for descriptions and troubleshooting of all the remote messages. When all the slides have been presented, a prompt will appear asking if you would like to finish the presentation or continue (review). Click Finish Presentation to exit the presentation. Select a Participant List, see Creating Classes for details. Select where you would like to save results file. Manual Save: Name the results file and select a location to save the .qrx results file. Auto Save: The file name will contain the document title, participant list, date, and time. Select a location to save the results file. Auto Save to Results Manager: The results will save in the Results tab, in the class name folder, when the presentation is complete. Select how you would like to present the activity. Presentation on Autopilot: Automatically cycles through presentation, adding a 15-20 second timer to each slide. Games Modes: Select from four game options including Fast Track, Quandary, Mission to Mars, and Baseball. See Games for details. 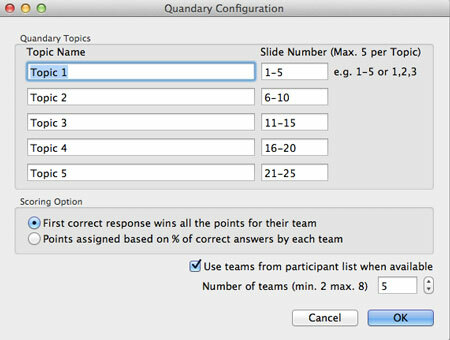 Allow participants to change their answer – checking this option allows participants to change their answer for the current question slide. Send right/wrong feedback to remotes after answering – remotes will receive a check mark if answer is correct and an X if answer is incorrect. Remotes will receive both a check mark and X to indicate that the response has been received if feedback is turned off. Override question point value with global point value of —- points – enter the new amount of points that will be temporarily applied to the slide for that presentation. Timer – you can select no timer, use the time set within the slides, or global timer by entering the number of seconds for all slides in the presentation. Use the default Host Session ID or type in a custom Session ID in the User Session field. Custom Session ID numbers are a quick fix if you receive a replacement host and don’t want to reprogram your participant remotes. Check the Require Login by ID box if you would like students to login using their Participant ID. Perfect for classrooms were students don’t have assigned remotes. See Remote Login for details. Check Show Login Screen to monitor participants logging in. 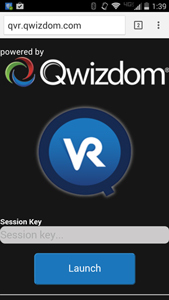 In order to present using the Qwizdom QVR, you are required to purchase a QVR license and register for a Qwizdom Online account. Click on Enable Web-Based Q-VR Support. There are many ways to customize your Qwizdom presentations. Click the QwizdomQ-menu.jpg Q menu and select Settings. The response indicator displays the number participants who have answered over the total number logged into the session. Click the Q menu and select Settings. Check the Show Timer box and select Use Timer From Slides. Time limit is set when creating slides. Timer will be applied to the following slide. Remotes will not be able to answer when time is up. Click the Q menu and select View/ Answer Grid. Right-click Answer Grid to change placement. Use Re-Pose, Response Graph, Pick and Game icons when presenting activities using a desktop or laptop. Click the Repose button to pose the question slide again. Click the Repose button again to stop. 1. Click the Response Graph button. 2. The Response Graph appears. 3. Click the Response Graph again to remove the graph. 1. Click the Pick button to randomly call upon a participant. 2. The participant’s name or participant ID appears on screen. 3. Click the Pick button again to remove the name. Click the Joystick.jpg Game button to view game windows, including scores, animations, etc. Click the QwizdomQ-menu.jpg Q menu and select Settings. Check the Send Right/Wrong Feedback box. Use the presentation toolbar if you would like to annotate a live presentation using a desktop computer or Q7 Presenter Tablet. 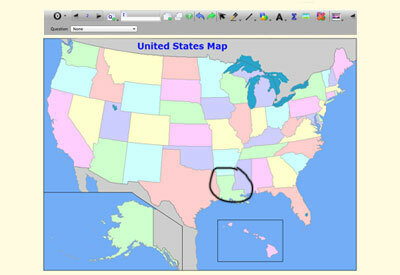 Click to expand the toolbar to display annotation tools. 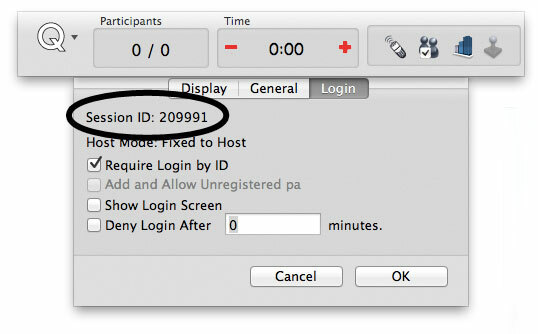 Logging in with IDs allows participants to use any remote. The participant is identified by a unique ID number that is set in participant lists. (Go to Creating Classes for more information). Maximum number of digits allowed for IDs is: · 8 for Q2RF remotes. Select an activity or create one to present. Please note: If Add and Allow Unregistered Users is checked, participants not on the class list, may be prompted to enter their User ID twice to confirm. Press the (5) key to display the list of participants who have requested help. Press Back to exit. The Q5RF Instructor Remote will display Ready or Last Key. Press the / key on the Q5RF Instructor Remote to display the response graph. Press the / key on the Q5RF Instructor Remote to close the response graph. Press the Pick (.) key on the Q5RF Instructor Remote to randomly call upon a participant during presentation. 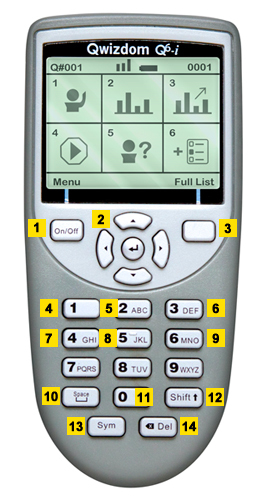 Press the 1 (A) key on the Q5RF Instructor Remote to go to the next question in Fast Track/Mars Mission games. 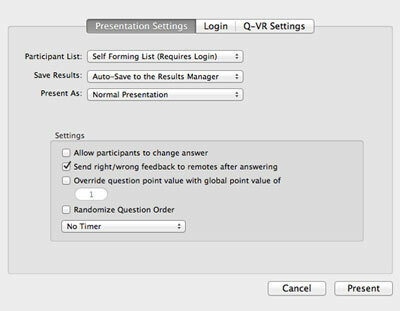 Press the circle key, in the thumb pad, to close out of the presentation (must be on last slide), play the PowerPoint® animation and schemes (if any were applied), move to the next slide, or display/hide the correct answer on response graph. Remotes’s displays will vary when they are Ready to Start an activity/presentation. 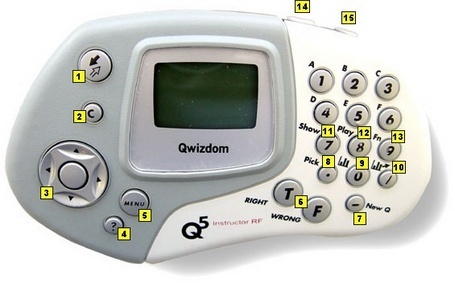 Qwizdom will be displayed on the Q4RF and Q5RF remotes when a lesson (nonquestion) slide is in view. Ready will be displayed on the Q6RF remotes have found the host and are ready for a question slide. Remotes’ displays will vary during an activity/presentation. For Q2RF remotes, press the Help (Hand) key. To request help on the Q4RF, Q5RF and Q6RF remotes, press the Menu key to select Help and press Send. To change the Session ID on the Q2RF remote, when the remote is on, wait for the remote to time out and turn off. When you turn it back on, press the Help key. When you see –S on the display, enter the Session ID and press the Send key to confirm.To change the Session ID on the Q4RF remote, press the Menu key and use the right arrow to scroll through the menu options. When you see Sess. ID, press the Send key to select it. An existing Session ID may appear and the remote will ask if you want to change it. Press T for yes and enter the new Session ID. Press the Send key to confirm. To change the Session ID on the Q5RF remote, press the Menu key when the remote displays No Host Found. Use the thumb pad to navigate through the menu options and press the Send key to select Enter Session ID. To change the Session ID on the Q6RF remote, press the Menu key, scroll to Enter Session ID, press the menu select key, re-enter the Session ID, and press the Search Again key. The Q4 LCD screen on the participant remotes may read Push Key, Inactive, Not Active, press the Send (double arrows) key to “wake up” the remote. If the remote still displays Not Active, re-enter the Session ID. Go to Changing Session IDs for more information. If the Q4RF displays No Net, or the Q5RF remote displays Host not found, Session ID Not Found, or the Q2RF remote displays – – – and turns off, re-enter the Session ID. Go to Changing Session IDs for more information. Numeric – enter the numbers and than press the Send key. · Sequence-enter the numbers in the correct order and press the Send key. In the Presentation Setup window, select the presentation options (i.e. Participant List, Save Results and Present As). See Presentation Setup for details. Click on Q-VR tab. 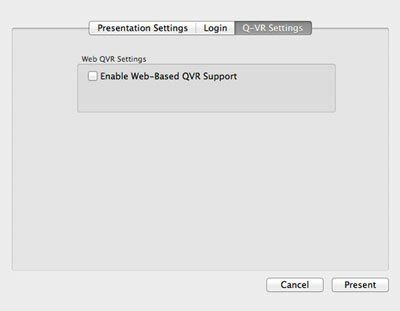 Check Enable Web-Based Q-VR Support. Click Present to begin. 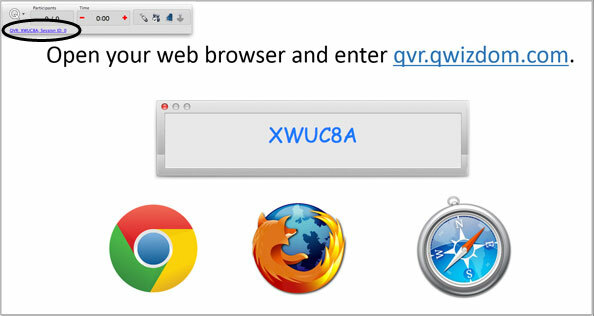 Instruct participants to login to the QVR session at qvr.qwizdom.com using a browser of their choice. Additionally, participants can download an app from the Google Play or Apple App store. Participants maybe asked to enter a User ID, if you selected a class list in the Presentation Setup window. Response Graph During presentation, you can display a response graph to see the results of the question. There are two response graphs you can display: the public response graph and the private graph. Press the (3) key on the Q6iRF instructor remote. The response graph will appear on the computer screen. Press again to close the response graph. Click Details to view Response Times and participant that have not responded. Toogle through menu options to view response times and a list of participants that have not responded. Please Note: The public and/or private graph must be closed (follow step 3 above) before moving to the next slide. 2. The response graph will display on the Q7RF tablet’s LCD. 3. Press the Private Graph icon on the Q7RF tablet again to close the response graph. Using computer mouse–click on the Game icon on the Qwizdom Toolbar. Q6i Instructor–press the right arrow key. Q5RF Instructor–press the number (7) Show key. Two teams are needed to play Baseball, which the program will automatically group by remote numbers : odd numbers vs. even numbers. The outcome of the game depends on the number of correct responses of each team for each question. Click the Present As drop-down arrow and select Baseball. A batter will appear for the team that is up; a question slide will follow. Click the Presentation As drop-down arrow and select Fast Track. A question slide will appear. Click the Presentation As drop-down arrow and select Mars Mission. Click the Presentation As drop-down arrow and select Quandary. Click the Quandary Settings button. The Quandary Configuration window appears. You can use pre-existing groups (see Groups for details) or have the game create temporary groups. Set the number of Teams (up to 8 teams). You will be taken back to the Presentation Setup window. Click Final Scores and then Yes (T) to end the game. The winning team will be displayed. The individual winner can be determined in the Player Scores screen. You can generate reports using existing saved results. Click on an Activity. The Overall Score Report will be displayed. Click the Report Wizard to view additional reports. View data in the Overview, Participants, Questions and Reports tabs. In the reports tab, click the Choose Report to Run drop-down and select the type of report you want to generate. · Attendance Report – displays participants’ names, IDs and login times. · Participant Group List Report – displays participant group information . · Participant List Report – displays general participant list information. · Overall Score Report – displays participant information with various point totals and scores. · Overall Answer Report – displays a class average bar chart, participant responses, correct answers and scores. · Summary Report – displays class percentages scoring at different grade categories, plus overall class statistics. · Question Detail Report – lists question type of each slide in the activity. 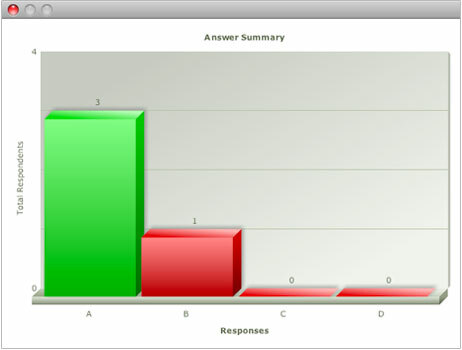 · Question Summary Report – displays a thumbnail preview of each question in an activity, with a bar chart indicating correct answer and percentage of class responses for each answer choice. · Standards Mastery Report – displays standards linked to specific questions, the class percentage correct and level of mastery. · Participant Comparison Report – displays a comparison between an individual’s responses and the correct answers, plus response time and overall score/grade. · Participant Standards Report – displays an individual’s performance on each standard linked in the activity. Any report can be exported to a .pdf or .csv file or printed. Click the Print button in the Reporting Wizard after the selected report type is displayed. The Print window appears. Click the PDF drop-down and select Save as PDF. The Save window appears. Enter the name with which you want the results to be saved. Click Save. The report is saved as a .PDF. Click the Printer drop-down and select the printer to use. Click Print. The report will print to the printer you selected. Add an answer slide or slide to a slide set. Open Content Manager, go to the Connect Apps menu and select Question Toolbar. Name the activity and click Done. The activity will appear in the Content Tree and the Presentation Setup window will appear. Click Begin to start the presentation. Select a question type from the Question menu (Multiple Choice, True/False, Yes/No, etc) and make desired annotations. (Optional) Click the public graph button on the Qwizdom Toolbar, Q6iRF, Q5RF or Q7RF Presenter Tablet to view results graph. See Response Graph for more information. Click the right-arrow to create and pose another question. When you are finished presenting, click the Content Utilities button and select Quit. The activity will be saved in the Content tab. Qwizdom Tools are located in the upper right-hand corner of the computer screen (next to the clock). Qwizdom Tools is a tray application, set to launch automatically on system startup. 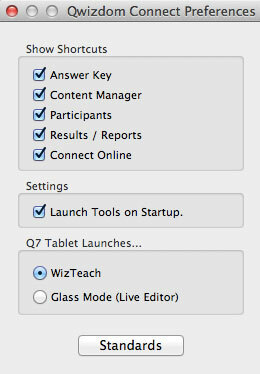 Qwizdom tools can be used to launch Qwizdom programs, check for updates or set features on the Tablet. 1. 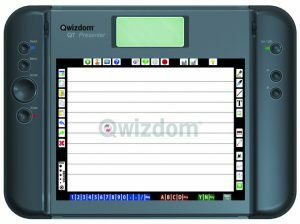 Click Qwizdom Tools. The Tools menu appears. Select Preferences. The Preferences window appears. Select shortcuts you want displayed in the list. Close window and the changes will take affect. Click on an application to begin. Close all Qwizdom software applications. If there are any updates available, the Software Update window will appear and list the release version, date, and the list of fixes. Click Install Update. The update will download. Once the update is done downloading, it is ready to be installed. Click Install and Relaunch. The Install Qwizdom Connect window appears. Click Continue in the Introduction. Read the information in the Read Me section and click Continue. Read the Licensing Agreement in the License section and click Continue. Click Agree when the “To continue installing the software, you must agree to the terms of the software license agreement” prompt appears. Select a destination to install Qwizdom Mac Connect in the Destination Select section. Click Continue. Click Install in the Installation Type section. Your computer may or may not prompt you for a password (depending on permission levels). Enter a password (if applicable) and click OK; or just click OK if no password is required. The update will begin to install. Follow the wizard as it guides you to apply the update.